July 30, 2010 –The Nelson Mandela Foundation hosted an evening with Ariel Dorfman on Wednesday night and invited select donors, stakeholders and staff to enjoy a screening of A Promise to the Dead: The Exile Journey of Ariel Dorfman. 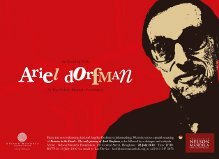 Ariel Dorfman, the acclaimed Chilean-American author and human rights activist, is in South Africa to deliver the Eighth Nelson Mandela Annual Lecture on Saturday, July 31. Dorfman has spent the last week in South Africa, participating in a number of events around the country which focus on reaching out to students, writers and the public at large and discussing issues of reconciliation, justice and the role of art in democracy. The evening started with a screening of A Promise to the Dead: The Exile Journey of Ariel Dorfman.f The documentary follows Dorfman’s return to Santiago after 18 years in exile, telling the story of the man who has dedicated his life to chronicling the injustices of General Augusto Pinochet’s military rule and to giving a voice to the thousands of people who disappeared during that time. Following the screening, guests were invited to ask questions. Prior to the screening, Dorfman took a tour of the Foundation’s Centre of Memory and Dialogue. On the tour he visited the Foundation’s processing room where all archive items are received and then processed prior to being moved to storage. Dorfman spent some time perusing the Foundation’s printed publications, including: Hunger for Freedom: The Story of Food in the Life of Nelson Mandela and A Prisoner in the Garden. He then went on to view some of Mr Mandela’s personal archives and saw some of the meticulous records that Mr Mandela has kept during his life. He looked at the oldest photo of Mr Mandela, and another he kept in his Robben Island prison cell, as well as his church membership cards and 1964 warrant of committal.